A pumpjack bobs on public lands in Utah. Photo courtesy of WildEarth Guardians. Backers of the "keep it in the ground" movement have taken their efforts up a notch, asking a federal court to force the Obama administration to consider the climate impacts of oil and gas leasing on public lands. In a lawsuit filed yesterday at the U.S. District Court for the District of Columbia, WildEarth Guardians and Physicians for Social Responsibility argued that the Interior Department's Bureau of Land Management failed to weigh the climate impacts for at least 397 leases issued since early 2015. 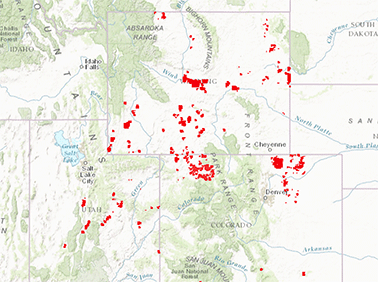 The leases represent a combined 380,000 acres in Colorado, Utah and Wyoming (Greenwire, Aug. 25). 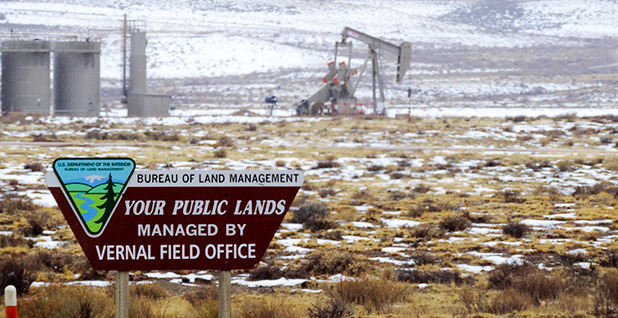 The lawsuit is one of the broadest challenges to federal oil and gas leasing to date, asking the court to freeze action on the contested leases until BLM performs an in-depth analysis of climate impacts from development on public lands. Without closer attention to climate impacts, the groups say, leasing undermines President Obama's efforts to mitigate climate change. "In spite of the President's commitment to U.S. leadership in moving towards a clean energy future," the complaint says. "Federal Defendants continue to authorize the sale and issuance of hundreds of federal oil and gas leases on public lands across the Interior West without meaningfully acknowledging or evaluating the climate change implications of their actions." The lawsuit comes as the "keep it in the ground" movement gains traction across the West — with several environmental groups and grass-roots activists protesting lease sales and pressuring government officials to prioritize government action. "The Interior Department is in climate denial," WildEarth Guardians attorney Samantha Ruscavage-Barz said in a statement. "We're breaking global temperature records every month and every month Interior ignores climate impacts and leases more and more oil and gas from public lands. When does it stop?" The group in January petitioned Interior to do a programmatic study of climate impacts from oil and gas on public lands. Agency officials declined to comment specifically on the lawsuit, but a spokeswoman for BLM noted that the agency is working to "modernize" leasing and minimize environmental impacts. "Although we do not provide comment on pending litigation, the BLM has been working over the last several years to update and modernize the rules governing its oil and gas program," spokeswoman Kimberly Brubeck said in an email. "The BLM will continue to work with lessees and operators to implement best management practices and to promote safe and efficient operations and minimize impacts to the environment." The lawsuit challenges recent leases across Colorado, Utah and Wyoming. Map courtesy of WildEarth Guardians. Industry representatives, meanwhile, slammed the lawsuit as a "frivolous" attempt to force agency action on an issue that is not supported by law. Kathleen Sgamma, vice president for government and public affairs at the Western Energy Alliance, referred to a May comment by Interior Secretary Sally Jewell that activists are "naive" to think the United States is ready to fully transition to renewable energy. "It's much easier to just file a frivolous lawsuit than it is to change the law through Congress," Sgamma said in an email, referring to the Mineral Leasing Act. "The law is on our side, and we agree with Interior Secretary Sally Jewell that these actions to stop domestic energy production are naive." Sgamma said the Western Energy Alliance is not planning to intervene in the lawsuit at this time. The industry group is currently involved in its own challenge to the Obama administration's leasing practices. In a lawsuit filed two weeks ago, the group accused Interior of violating the Mineral Leasing Act by failing to hold quarterly lease sales (EnergyWire, Aug. 12). According to the environmental groups, the agency's current leasing practices are both "immoral" and "illegal." Specifically, they're challenging the recent leases under the National Environmental Policy Act. They say BLM violated NEPA by failing to identify lease sales' direct greenhouse gas emissions, indirect downstream emissions and cumulative emissions when combined with existing onshore development. "Combined, it is reasonably foreseeable that the lease sales could result in thousands of new wells across public lands in the Interior West, adding significant levels of GHG emissions to the atmosphere and further endangering the Earth's climate," the lawsuit says. The challenge goes on to list numerous policy and rulemaking actions that support climate action: U.S. EPA in 2009 issued a formal finding that greenhouse gases threaten public welfare; Obama issued two executive orders calling on federal agencies to measure and reduce emissions; and the White House Council on Environmental Quality this year issued guidance for measuring climate impacts. "Nevertheless, there remains a fundamental disconnect with regard to how our public lands are managed for energy production and national policies to limit GHG emissions," the environmental lawyers told the court. The environmental groups, represented in part by the Western Environmental Law Center, say the "disconnect" is resulting in NEPA violations. On indirect impacts, for example, the groups say BLM officials have dismissed emissions estimates as "highly speculative," but with that approach, they are effectively assuming the downstream emissions are zero. And the groups say the impacts of emissions are especially tough in the West. "The West is experiencing increasing temperatures and prolonged droughts," they said. "The impacts of these changes are widespread across our forests, wildlife, and human communities, threatening the West's resilience in the face of continued warming."